WHAT'S UP THE PIKE [COMING UP SOON]: County Council special primary this Tuesday; long-awaited Praisner and McKinnis interviews coming up over the weekend; "green" buildings planned for Burtonsville Town Center. Burtonsville residents wait for a candidate forum at Paint Branch High School to begin last Wednesday evening. 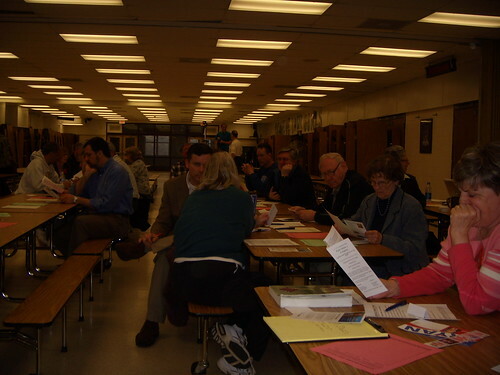 Property taxes and the revitalization of Burtonsville took center stage Wednesday night during a candidate forum at Paint Branch High School sponsored by Citizens Involved, an East County civic group. Nearly two hundred people came out to hear hopefuls for the open County Council seat - for which a special election will be held on Tuesday - and for the Congressional elections in November. 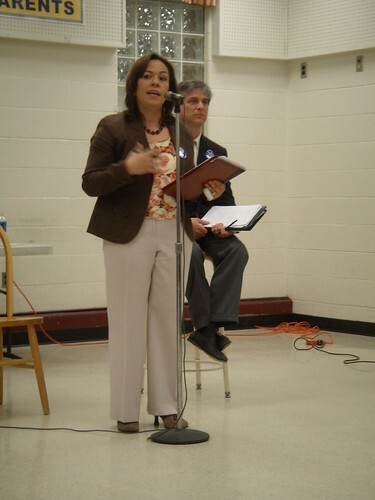 Current school board president Nancy Navarro (at right), who won the Washington Post's endorsement today, said she was frustrated by an "amazing disconnect between what I hear are very important issues - land use and development - and no discussion about poverty or education," she lamented, saying it was necessary to "listen to everybody to prioritize our needs." Consultant Pat Ryan, who volunteers for the non-profit group Action In Montgomery, bristled at Navarro's suggestion that she was the only one to mention low-income people. "I've been talking about affordable housing at every forum," Ryan said. In addition, he promised to talk to the State Highway Administration, who have continually rejected a request by local business owners for a sign on Route 29 announcing the Burtonsville Crossing shopping center. "I've dealt with pigheaded bureaucrats for the past thirty years," he said. "I know how to deal with them." Steve Kanstoroom, an Ashton resident who's made headlines for representing disenfranchised Sandy Spring landowners, stressed his history of advocacy. "I've been advocating for people full time, double time, paid staff since 2003," he says. "I'm bringing to you all the services other parts of the County get." He was unfazed by the Gazette's recent endorsement of Pat Ryan for the Democratic nomination. 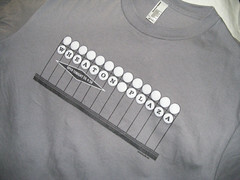 "The Gazette recently endorsed Al Wynn," scoffed Kanstoroom. "The Gazette endorses people who don't win." From left to right, Democratic candidates Pat Ryan, Don Praisner, Nancy Navarro and Steve Kanstoroom listen to Daniel Straub from Citizens Involved speak before the forum began. Don Praisner, widower of former Councilmember Marilyn Praisner, stressed the need for optimism about the Council's ability to handle the budget crisis. "You have to have some trust in government," he said, but noted that they have a difficult decision to make. "We've put ourselves in a position that either we have to break the charter [limit on property taxes] or cut services." The crowd thinned out considerably after the Democratic candidates spoke, and as a result, the Republican candidates who followed were more light-hearted. "If County statistics are accurate, there are probably three Republicans in the room, and I'd appreciate your vote," said Spencerville resident Robert Patton. As his campaign manager, perennial candidate and MoCo gadfly Robin Ficker (at right) was bullish on Mark Fennel's chances of winning the Republican nomination of Tuesday. "No one was talking about fiscal policy before, but we made property taxes the issue," says Ficker as he flagged down cars on Old Columbia Pike, campaign signs in hand. During the debate, he planted a question about his latest referendum - which would require all nine Councilmembers to vote for raising the limit on property taxes in order to lift the current cap - earning him the ire of most Democrats and Republican John McKinnis, who didn't agree with his proposal. "No offense, Robin," said McKinnis, addressing him in the audience, "but there are other was we can do it and we can do it right." Aspen Hill resident Thomas Hardman (at left), who for $100 self-financed his campaign, promise to deal with code enforcement, citing the problems he's seen in his own community. "Neighbors do not have the right to ruin people's lives by having truck tire fires in their yards because they like to see things burn," he deadpanned. 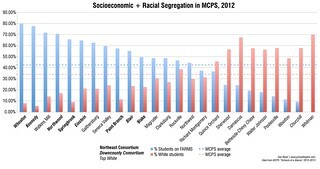 However, he disappointed members of the Paint Branch PTSA who asked candidates to pledge their support for funding the high school's modernization. "I've found that sometimes you make commitments and you have commitments that prevent you from keeping them," he said. Congressional candidates Peter James (R) and Donna Edwards (D) were both invited to the event, but only James showed up, making up for his opponent's absence by holding up a sheet of notebook paper with a drawing of Edwards' face on it. James promised a "money-back guarantee" if elected, offering to put his salary in a trust fund and return it to voters if he didn't hold to his promises. "If you don't see any action, you can vote for Donna Edwards and she can be in for another sixteen years," he snapped. Jonny Akchin, Edwards' field organizer for Montgomery County, spoke in her place, but many residents were not satisfied, approaching him after the event to ask where she was. "It's a very large district. She can't talk to everybody," Akchin lamented. He claimed that the campaign had not received word of the event until earlier that day, and Edwards had already made plans. 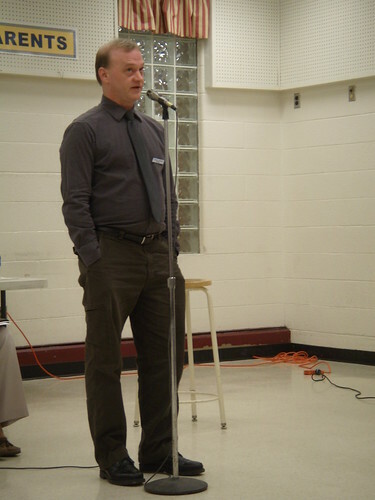 After the forum, Council candidates expressed frustration with the format, in which each speaker took turns answering a series of questions handed in by audience members. While responses were limited to forty-five seconds, the event dragged on for nearly three hours, delaying another debate immediately following in Four Corners. "I tried to make it as fun as possible, but I was tired," says McKinnis, who was the second-to-last to speak. "I was falling asleep through some of my answers." As a result, many candidates did not go to the second meeting, according to Adam Pagnucco at Maryland Politics Watch. They included Praisner, who didn't want to travel there at ten o'clock. The Burtonsville forum "wasn't handled right, to have a candidate stand up and answer twelve consecutive questions," he says. "It's just not fair to the candidates." Mark Fennel will win Tuesday because he is for property tax relief. We have had increases in sales, income, car and corporate taxes and hikes in Metro, water and electricity fee. Now the County Executive wants to give us the biggest property tax increase in 20 years. Only Fennel has our support because only Fennel is for propertry tax relief--he even has it on his signs! Property tax relief hero Mark Fennel has the support of the homeowners on my street and in my neighborhood. I am not a propagandist that nobody much believes. I'm tired of the Navarro-Praisner spin that we need to raise taxes every year. We need to control spending, waste, inefficiency and mismanagement. At least Fennel has worked at Citizens Against Government Waste. Everybody on the Hill knows that outfit. They discovered the infamous Bridge to Nowhere. If the Gazette endorses candidates who do not win(Kanstoorom quote) Then they should have endorsed me-- but I do not recall an endorsement. Maybe it was in code in the classifieds. Jerry Weast is Nancy Navarro's campaign manager. He meets illegally with her and the special interest unions which support her. Ike Leggett, of $65,000 toilet and biggest property tax increase in 20 years fame, is calling the shots in Don Praisner's campaign, managing the campaign. 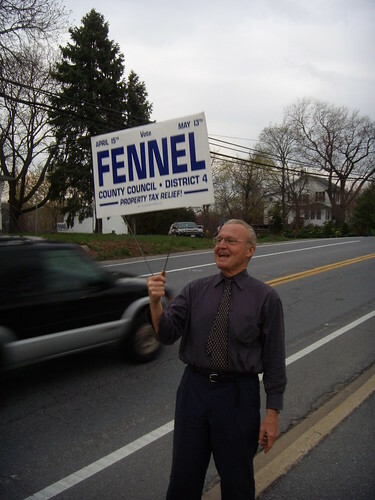 But Robin Ficker is NOT the campaign manager of Mark Fennel, he merely volunteers from time to time such as the time you photographed where he was engaging in Montgomery County's 50 year old practice of sign waving, not flagging cars down. JustupthePike has referred to Robin Ficker 3 times as "gadfly." Why? Because he has collected the signatures to place charter amendments on the ballot which have received more than 2,000,000 votes? Ficker is referred to as a candidate, but he is not on the ballot, nor is he running as a write-in. Uh, thanks but Jerry Weast is not Nancy Navarro's campaign manager. Nice try. Robin Ficker is Fennel's de facto manager. I don't have a campaign manager. Can I still come out and play? I should point out that while some other candidates have pledged not to exceed a certain level of rate increase of property-taxes, I have stated for the record that I don't want to increase taxes at all and would exceed the charter amendment rate increase limit only to honor a contract, and that if someone backed me into that corner by signing contracts that forced such a rate increase, I'd be spending a lot of my time thereafter trying to lose them their job. Have any of the other candidate stated that they'd cheerfully try to get people fired for costing the taxpayers too much money? No? I didn't think so. I guess that's why they call me "the most dangerous man in Montgomery County politics". I'm not all about party or ideology... I'm about giving the taxpayer their money's worth, and doing it on a budget that won't break the bank. After two years, if the County was still running in good shape, their jobs would be eliminated. Meanwhile, by paying them to stay home, the county would have saved money - there would have been no pension comtributions, unemployment insurance and whatever else it would have cost the county to have them come to office. Jerry Weast, Manager, & Nancy Navarro, Managee have been meeting at Weast's home with union leaders discussing campaign strategy. As Dan says, the Burtonsville forum ran very late. But while the Northwood-Four Corners debate, which followed Paint Branch, did not have as many attendees (since they had to wait several hours for the candidates to arrive), it did take place in a politically active neighborhood facing a crisis over destruction to their park. For the record, the candidates who drove down from Burtonsville to Four Corners late at night included Democrats Nancy Navarro and Steve Kanstoroom and Republicans Thomas Hardman, Mark Fennel and John McKinnis. All five candidates literally drove the extra mile to cover their district. 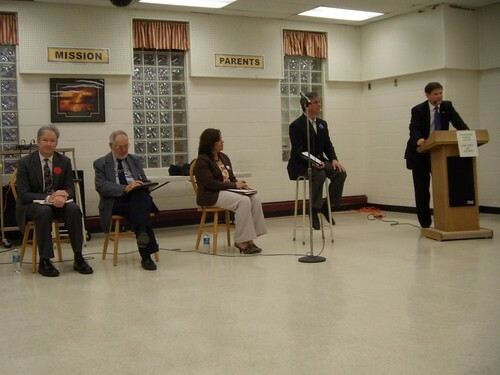 Dan quotes one of the Democrats who did not attend the Four Corners debate as saying the Burtonsville forum "wasn't handled right, to have a candidate stand up and answer twelve consecutive questions... It's just not fair to the candidates." Sir, it is not fair to District 4 voters in Four Corners that they should wait almost three hours for a candidate who declines to show up. Hey Fennel and Ficker, stop posting propaganda for yourselves under "anonymous"! Hey Jerry Weast and Ike Leggett, stop directing the campaigns of Nancy Navarro and Don Praisner and writing their anonymous comments for them.